How do I read a strobe display? Basically, the strobe image appears to travel to the left if your instrument is flat of the desired pitch and to the right if it is sharp. On earlier models such as the StroboStomp 1, StroboStomp 2, VS-1, VS-II and V-SAM, the strobe image travels upward if your instrument is sharp and downward if your instrument is flat of the desired pitch. Adjust your instrument until the pattern is as close to still as possible. Strobe displays are 'real-time' and extremely high definition. They require very precise tuning adjustments to stop the display because the frequency/pitch of any instrument is never totally stable. You'll quickly learn to read the display, make the most precise adjustments and appreciate the high resolution that only a Peterson provides. Help others find this information sooner. What is my ’s Sweetened Tunings feature all about? A Sweetener is a set of cent offsets or a deviation from generic Equal Temperament interval spacing traditionally used in tuning. Tuners made by Peterson, including the , contain many choices of “Sweetness“, in other words, several presets with differing interval spacing relevant to the instrument being tuned. If you’ve never been happy with how your instrument tunes up with your present tuner, a Sweetener could be just the thing to change that without any modifications whatsoever. The offers unique and very accurate “tweaks” which often make all the difference, try it! Is the accuracy the same for all Peterson tuners? Yes, the accuracy is within 0.1 cents (1/1000 of one semitone) as with all Peterson Strobe Tuners. An important thing to note is that Peterson Strobe Tuners have ultra high definition displays, so not only are they highly accurate in detecting a note but they have the ability to display that accuracy. Other products claim accuracy but do not have the high definition screen to display the level of accuracy in which they claim. If you cannot see the accuracy, it is of little value. Only Peterson provides High Definition Strobe Tuning. Is there a carrying case available? We have carrying cases available that are very useful if you will be frequently traveling with your Peterson tuner. You may purchase your case directly from us at Peterson. Cases are available for the AutoStrobe™ line and the StroboClip HD. The StroboPLUS HD comes with packaging that has been designed to protect your tuner. Does my tuner require calibration? Generally, your tuner will not require calibration and should remain perfectly accurate if it has not been damaged. Unlike more modern Peterson strobes, legacy models such as the Peterson 400, 420, 450 and 700 do require occasional calibration. If you require service, please open a support ticket and return the tuner for repair. Which Peterson products work with Peterson Connect? Currently, the StroboPLUS HD, StroboClip HD and the Stomp Classic Pedal Tuner / Active DI are compatible with Peterson Connect. I often tune my acoustic instrument in a loud environment. What's available to help with that? When tuning an acoustic instrument in an environment where you cannot control the background noise, like at a gig or loud band hall, a vibration pickup is a very nice alternative to using the built-in microphone. For instruments with a flat resonating surface, you can use a suction cup tuning pickup to reduce ambient noise interference. A Peterson TP-3 clip-on tuning pickup is a very versatile device that can be clipped onto any portion of the instrument that vibrates, such as the headstock of a guitar or the bell or lead pipe of a horn. How accurate is my ? Your is accurate to 0.1 cent (1/1000th of a semitone). It’s important to note, that unlike other tuners which list the detection accuracy as the main specification, the detection AND display accuracy is 0.1 cent due to its high definition display which is the highest of any tuner on the market. How do I send my product in for repair? If you need to send your tuner in for repair, please open a support ticket. All products returned for service must have a support ticket number on the outside of the box as well as on the accompanying paperwork on the inside of the box. If you have not registered your tuner, you must do so before returning it. Include a description of your problem. Please be specific about the type of malfunction as well as the conditions under which it occurs. There is a minimum charge of $70.00 US plus a shipping charge for all Peterson tuners received (unless subject to Peterson warranty). Payment options include C.O.D., VISA, MasterCard, and Discover Card. NOTE: For international (non-USA) repairs and for all Conn tuner repairs, a different procedure may apply. If you would like an advance estimate for service, you must include a request in writing with the tuner you ship. How do I find out how far out of tune my guitar is in cents? Pluck a string and adjust the cent value by simply adjusting the cent control until the strobe image is stationary (only fluctuating around a fixed position and not shifting in one direction over time). In this case, you are tuning the tuner to the instrument. When the image comes to rest, the accompanying numeric cent display indicates the distance from 00.0 cents. 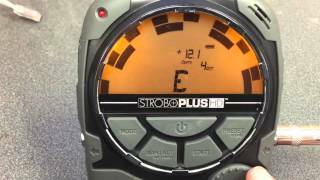 The following video shows this process using a StroboPLUS HD. Measuring a pitch in cents. What should I do if my new Peterson product doesn't seem to work properly? If you've first tried all of the solutions offered here, please contact Peterson directly. It is important that you do NOT return the product to the store in which you purchased it without Peterson instructing you to do so. If your unit is problematic, we would like to limit the chances of another customer purchasing the returned unit. Always arrange for product service or replacement directly with Peterson. How do I manually update Peterson Connect for Google Chrome? Click on the three horizontal lines in the upper right corner of the Chrome browser. Choose More Tools, then Extensions. If this doesn’t work, you can delete the extension from the same page and re-install Peterson Connect for Google Chrome. What is the range of Hz calibration or Concert A calibration of my ? The Hz calibration range of your is . The default setting is Concert A 440Hz. Not finding an answer? Open a support ticket for personalized support of your Peterson product.